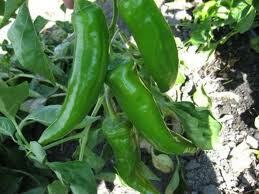 Anaheim peppers (also known as chile Verde del Norte) are widely grown throughout northwest Mexico. 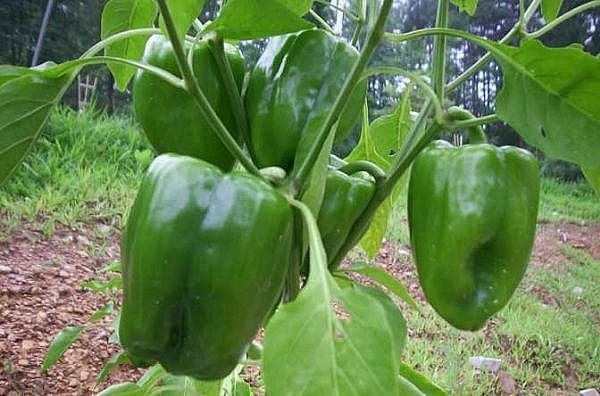 These light green chiles are long, taper at the base and are usually mild in flavor. These peppers are great in chili, fajitas, burritos, veggie egg scrambles, enchiladas, or salsas, or can be stuffed and baked. As with any pepper, their flavor varies, so please taste test a tiny bit to see how much heat the pepper carries. If you are sensitive to spicy food, you will need to remove any seeds and white ribs from the pepper before cooking. Be aware of cutting hot peppers with bare hands, as you need to wash your hands well before touching any sensitive body areas! If you don’t plan to use them while fresh, the whole chili can be roasted and then frozen for later use. The Antohi pepper is named after a touring acrobat that brought the seeds to the United States from his mother’s garden in Romania. 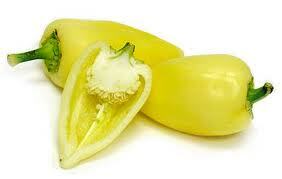 This yellow pepper is mild and sweet. This heirloom European pepper looks like a small carrot, thus the name. Also known as Shipkas, the carrot pepper is great for salsas, marinades, pickles, chutneys, roasting or adding to any dish you want to give a kick to since this pepper is spicy. 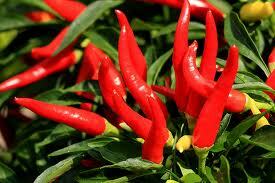 Cayenne peppers are slender, long, and bright red. They are thought to have originated in South American. 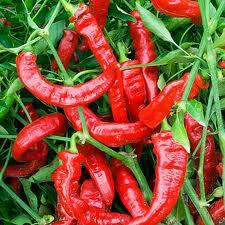 Cayenne peppers can be used fresh or dried and can vary in spice level due to many growing variables. Removing any seeds and veins helps reduce the level of spice but always make sure to wash your hands after cutting raw chiles and taste a tiny bit raw to check the heat level. 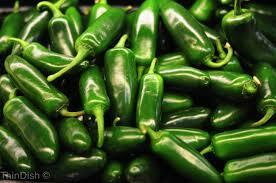 Jalapenos tend to be plump and cylindrical, and range from green to red. 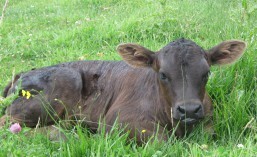 They are named after Jalapa, the capital of the state of Veracruz. 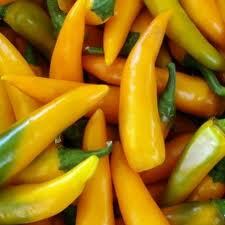 Jalapeo peppers can be used fresh or dried and can vary in spice level due to many growing variables. Removing any seeds and veins helps reduce the level of spice but always make sure to wash your hands after cutting raw chiles and taste a tiny bit raw to check the heat level. Nardello peppers are another heirloom variety that hails from southern Italy and named after the man who brought the seed to the United States. These sweet peppers are mild and sweet with a crinkly green exterior. Paprika peppers can range from mild to hot and this variety falls in the middle. While native to Eastern Europe, many varieties are now grown throughout the world. These small red peppers would make a great addition to stir fries, breakfast scrambles, eggs dishes, pasta dishes and of course, any Hungarian dish. Poblano Peppers are usually used in sauces, salsas, and stuffing mixes. The membranes and seeds of Poblano peppers is where most of the heat is found. So, if you don’t want it to be quite so spicy, be sure to take the veins and seeds out before using the pepper. To prepare Poblano peppers it is best to roast them with a little olive oil or grill them until they are soft enough to peel the skin from the pepper. To do this without a lot of hassle it is best to roast the Poblanos with a little olive oil then place them in a bowl covered with plastic wrap so the steam helps to separate the skin from the flesh. Before long the skin will be soft enough to peel off in sheets. Some recipes will call for searing Poblanos until the skin is black by placing them in a broiler or over an open flame. Poblanos can be stored and even frozen in airtight containers for many months until you are ready to use them. You can also choose to dry the peppers out for later use. Dried Poblanos are also known as Ancho chiles, which means wide chile in the Spanish language. 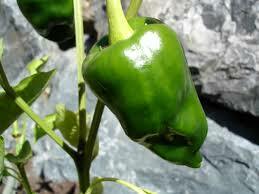 They are given this name because when Poblano peppers are dried they become very flat, wide, and heart-shaped. If not using right away, store peppers in a plastic bag in the refrigerator. They will keep for a week or more but too much moisture in the bag will cause them to mold. Fresh peppers are great additions to salads and veggie platters but can also be stuffed, grilled, or roasted. They make a great addition to stir-fries, veggie browns, quesadillas and soup. Sweet peppers go well with tomatoes, eggplant, onions, summer squash, olives, capers, mozzarella, Fontina, goat cheese, basil, garlic, and olive oil. Sweet peppers go well in salads and stir fries, while the hotter ones do well cooked. Place the whole chili over the open flame of a gas stove or grill, and turn it from time to time until the skin is blistered and brown. If you want the peppers to be soft and slightly smoky, roast them until the skins are completely charred. If you want to peel the peppers without cooking them too much, cut off the top of the pepper, then slice in half lengthwise, remove the seeds and veins, and press down on each half to flatten. Roast them 5 to 6 inches under the oven broiler until the skins are wrinkled but not charred, 10-20 minutes. 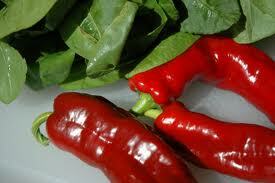 Once done charring the skin, immediately place peppers in a plastic bag or in a bowl covered with a plate to steam. Let steam for at least 15 minutes to loosen the skins. Use your hands or a paper towel to gently rub off the skin and don’t worry if not every fleck is removed. Try to avoid rinsing them under water, as you will wash away the good flavor developed during roasting. Once peeled, cut open whole peppers and remove any seeds and ribs. If you plan on drying chiles, use a sewing needle and heavy thread to string peppers through the base of the stem. Hang in a cool, dry place until dried throughout.